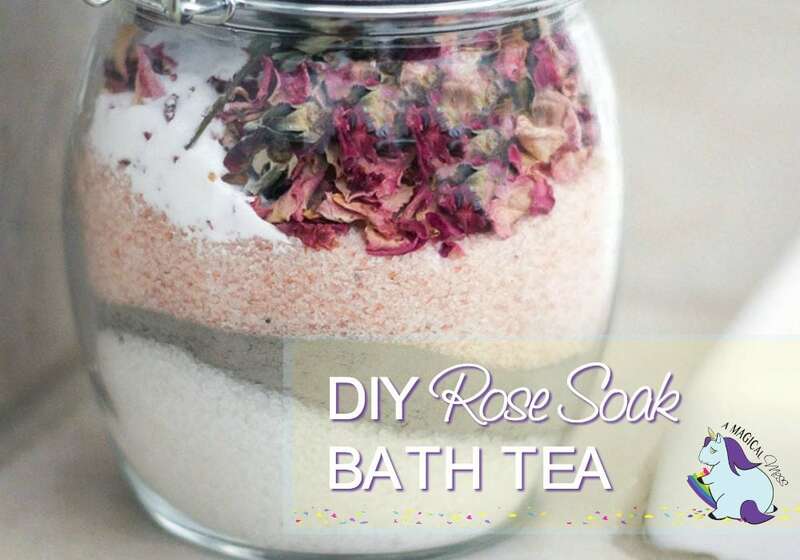 A rose petal bath soak sounds good, right? Well, it’s not always as romantic as they make it seem in the movies. Soaking in rose petals is nice, but then what? Grab your pool skimmer and fish them out? 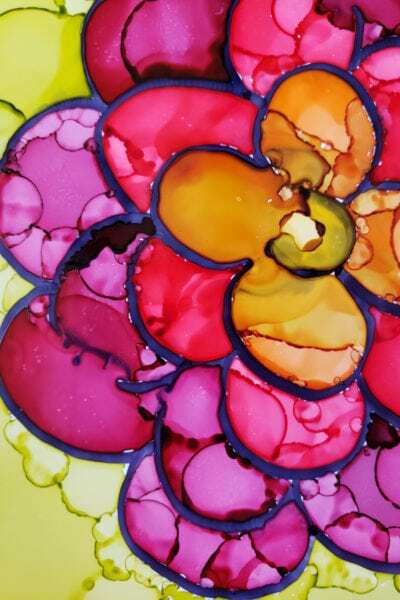 Fresh petals are sure to clog the drain. 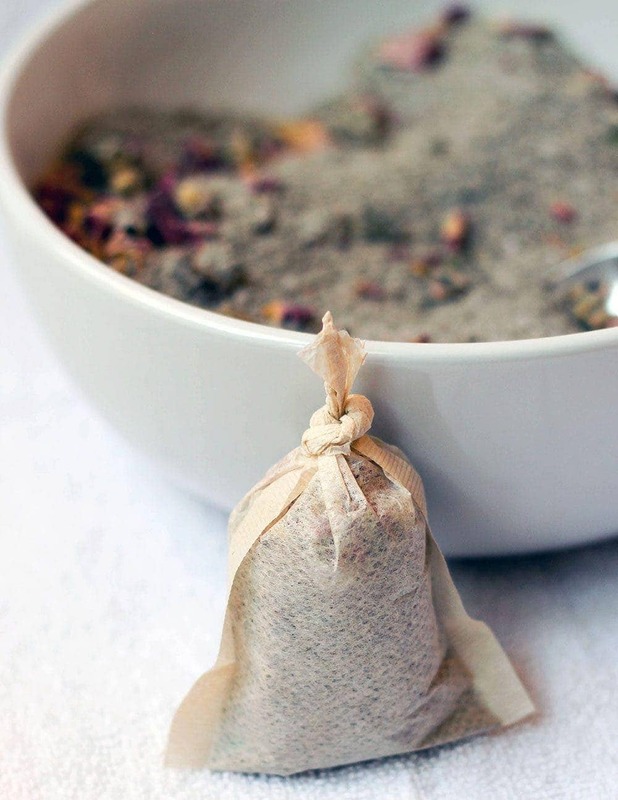 Make bath tea bags to soak without the mess. 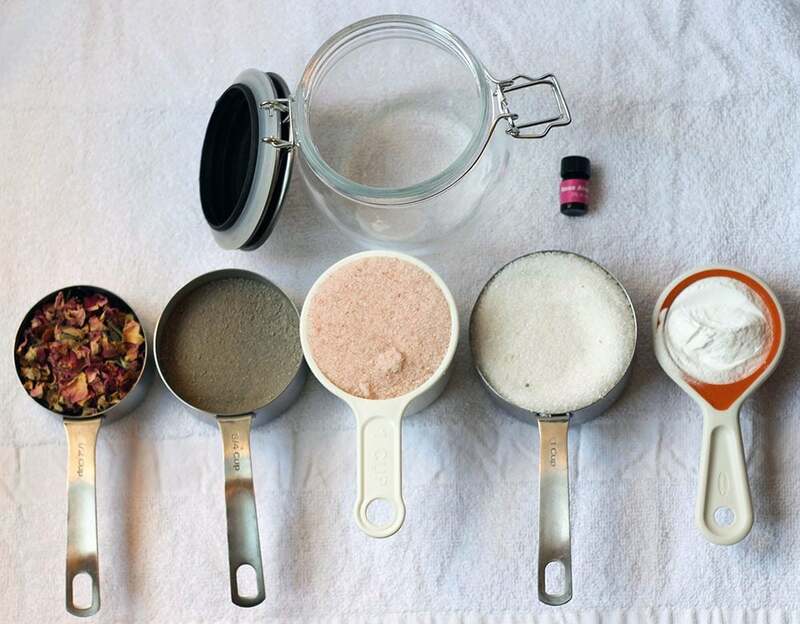 I go through phases of dabbling with aromatherapy and natural recipes – see my PMS salt soak from a while back. It seems as though, I am in “on mode” which is just fine. Since I got off medications, I want to find natural ways to help relax and get my mental health in order. I AM NOT GIVING MEDICAL ADVICE. Let’s get that out of the way. 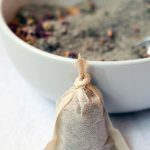 I’m just recognizing and enjoying the benefits of aromatherapy and some of the other natural ingredients you’ll find in this rose petal bath soak. Tub tea bags – is that not the cutest? I saw them on YouTube and felt the need to mass-produce them immediately. 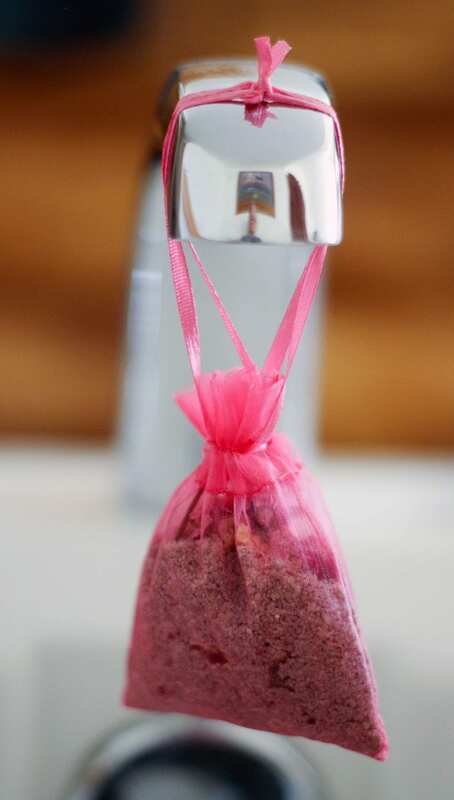 Bath tea bags make great wedding favors, Valentine’s day gifts, Mother’s day gifts, or for anyone who needs to relax. You can get a bit more creative than I did with the tea bag. I tied a knot at the top, which is not the most attractive presentation. I have to crawl before I walk with this crafty stuff, okay? 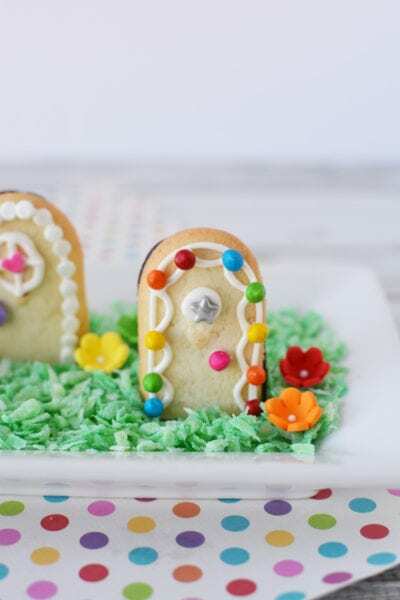 But, it would be easy to create a decorative hanging tag. 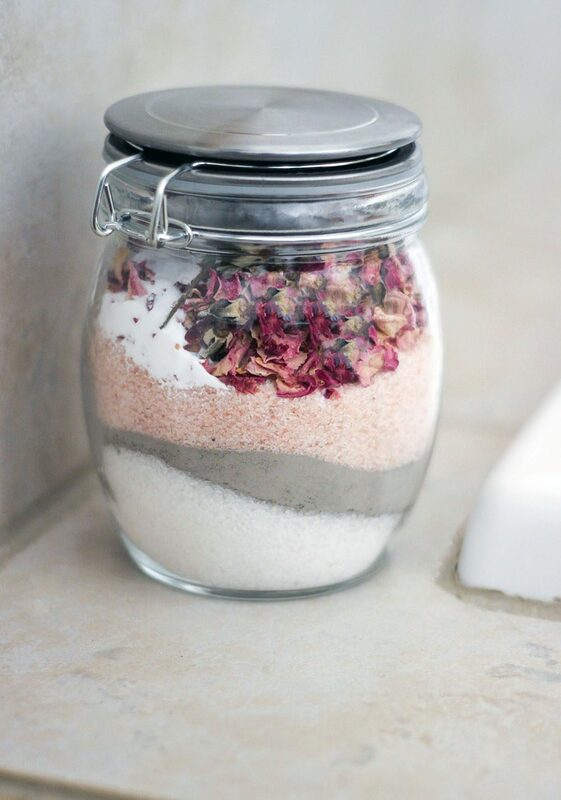 From the book: Homemade Bath Bombs, Salts & Scrubs: 300 Natural Recipes for Luxurious Soaks by Kate Bello. Make a bath soap using teabags for less cleanup. 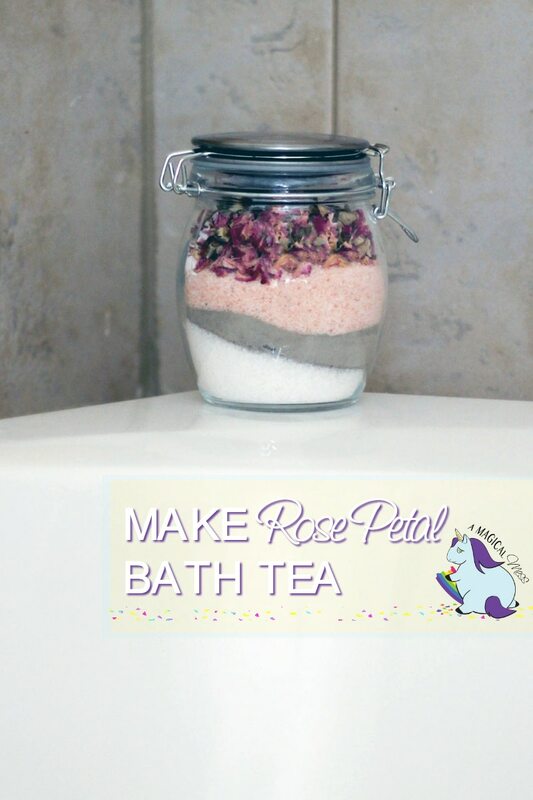 This rose petal bath soak smells amazing. Layer all salts, baking soda, clay, and petals in a jar. Top with essential oil. You can skip this and mix directly in a bowl if you are making tub tea. Add mixture to either tea bags or muslin bags. Either layer in a jar like I did or simply mix everything in a bowl. 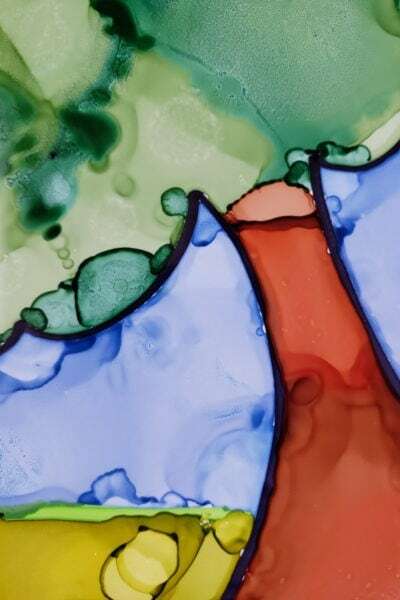 I think the layered jar makes a pretty gift and looks decorative sitting next to your bathtub. However, you’ll eventually have to mix it up and add it to the tea bags before using. 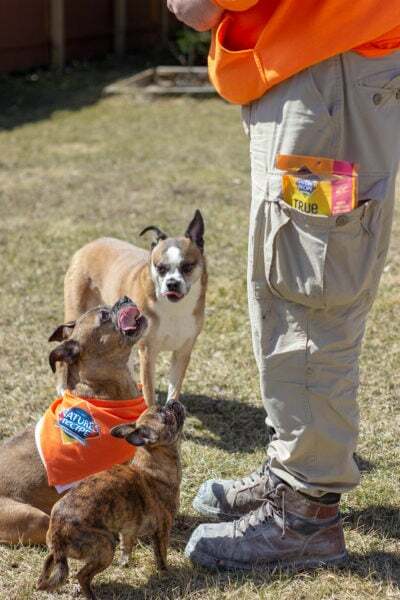 Use empty tea bags or a muslin bag with a drawstring. The pink bag I used in the picture is what the rose oil came in, and I am not completely sure if it’s the best idea. I have no clue what kind of dye they use to color that bag, and it might defeat the purpose of making this all-natural bath soak. Toss the sealed tea bag into the tub and let it soak. Or, hang the bag under the faucet, so the running water hits it. 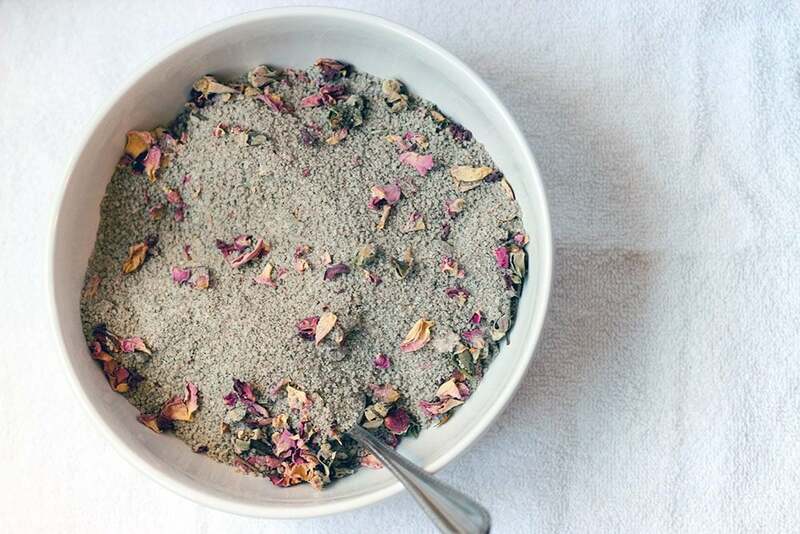 Each ingredient in the rose petal bath soak is therapeutic and healing in different ways. She goes into detail about the benefits in the book, but the one that stood out to me is the dead sea salt. Dead Sea salts are known to help reduce insomnia and anxiety. The French green clay helps to tighten pores. So basically, if you can’t find me, check the bathtub. 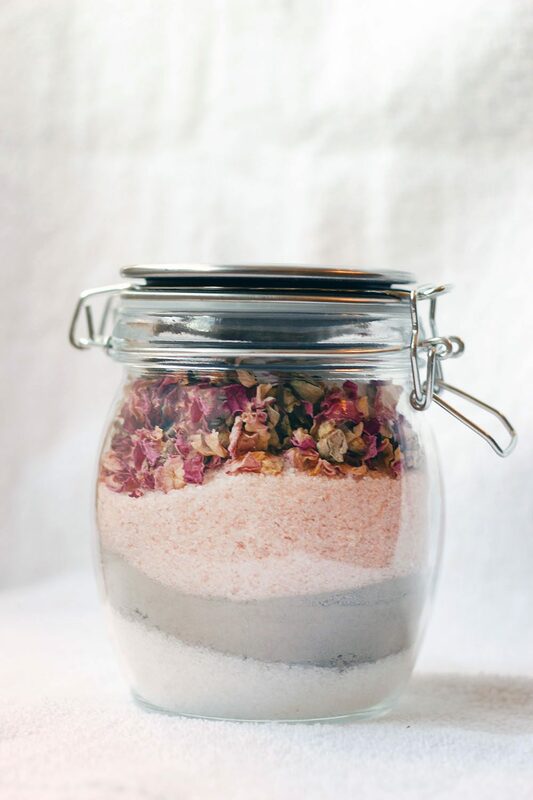 After the chaotic holiday season, cold weather, and just life, a rose petal bath soak is much appreciated. I cannot wait to play around with more bath soak recipes, so stay tuned. 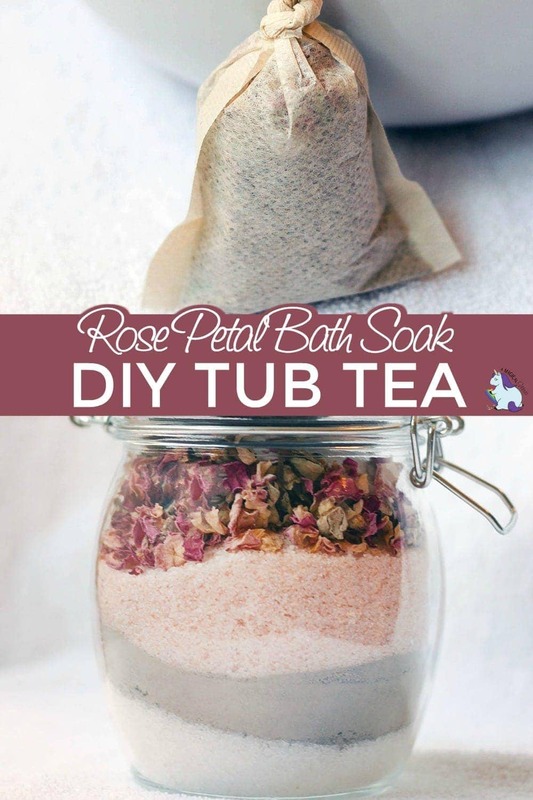 Have you ever tried a rose petal bath soak or bathtub teas? I would really enjoy making this and trying it! What a lovely gift also! What a great idea! A teabag would make it so much easier to clean out the tub. Thanks for sharing. The rose petals are a nice touch. This is one you have to put into a bag. I would love to make this for myself and for gifts it sounds wonderful I had to pin it so I could find it easier thanks for sharing it! 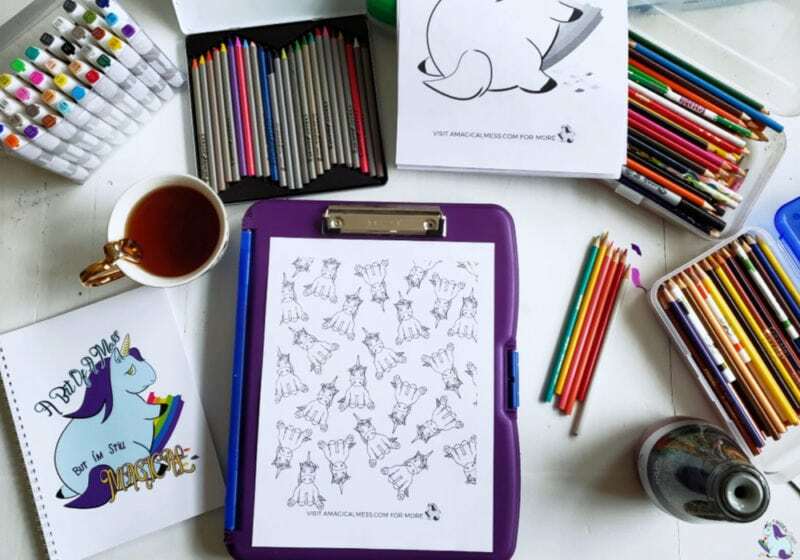 How lovely, and obviously a beautiful idea for gift too! I also think this would make a nice gift. It is so pretty and I bet it smells great! I like tulle bags for this kind of thing. This really makes me wish we had a working bathtub in the house! These lovely scented bath tea bags would indeed make great gifts. Thank you so much for the idea. Now all I have to do is engage my crafty side (sometimes easier said than done). Pinned it so I’ll be reminded to check for the ingredients when I’m ready to start. This is so cool! I used to fish out the petals one by one. Good thing I stumbled upon your article. Looking forward to more helpful post. I love this! This is very nice! 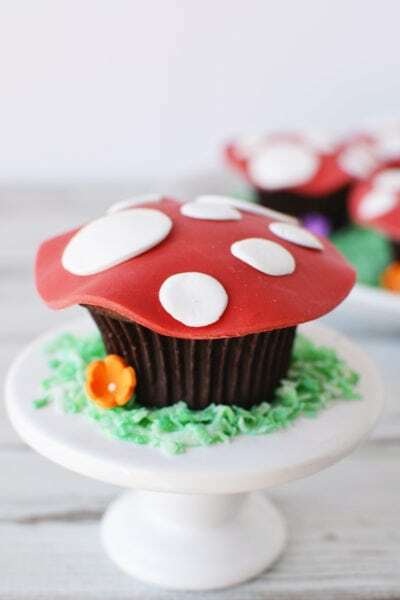 I will be making these for sure. Thank you! This sounds so relaxing and soothing. Can’t wait to try it!